SPARK PLUGS: A SMALL PART WITH A BIG JOB! When's the last time you had your spark plugs replaced? Unless it was fairly recent you probably have no idea. It's not commonly brought up by mechanics during a routine oil change. That's because we tend to forget about these important little plugs until there is a problem. Spark plugs hold a crucial role in your engine. The tiny spark of electricity that they pass along a gap is what causes the engine to combust and start. As you drive, your cylinders continue to fire and keep your engine running. The spark plugs bask in extreme temperatures to help you get from point A to point B. How do I know when it is time to replace? There are a few tell-tale signs that call for new spark plugs. Since spark plugs allow your car to start, when they are bad you will feel it as you turn the key. If you car shakes while idle or drives with rough, jerky movements then your spark plugs could be to blame. Poor plugs are linked to reduced fuel economy and increased pollution. 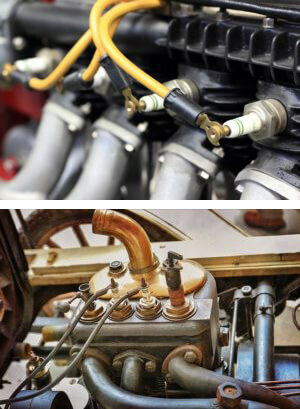 Worn-out spark plugs can cause loud, clicking, and clanging sounds to emit from under the hood. If you hear these while you drive, it's time to take your vehicle in for service. Where can I get these problems taken care of? If your spark plugs give you grief then drive into Metro Nissan of Montclair. Out service department will dive deep into the true cause of your car's problems and sort it out. You can even schedule services online. Visit MetroNissanMontclair.com to learn more.